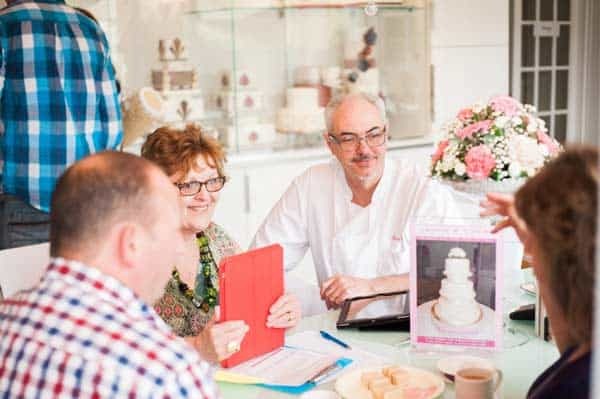 The photo below shows Jenny and Tom discussing the finer points of a wedding cake design with clients. Please Fill in our Wedding Cake Availability Request now. We will check our diary and let you know if we have availability for Your Wedding date. “Wedding Cakes can be very complex, with lots of individual details, such as cake flavours for each tier, sugar-paste colours, sizes,shapes, number of tiers, and crucially the decorative elements (such as lace detail, sugar-crafted flowers, beading, borders, ribbons etc. etc. It definitely pays to book ahead by a year or more if you can, to avoid disappointment.” advises Tom. We would love to work with you to design the wedding cake of your Dreams! We will get back to you as soon as we can, once we have carefully checked our availability for your date!